So this study is a really extensive one and I was attracted to it firstly because one of the partners was DDI, whose research I have always held in high regard, but secondly because it was jointly partnered with Ernst & Young, with whom I started my consulting career. So it’s really meaty and worth reading the report in its entirety, but I thought I’d pull out a few key themes to see what is top of mind for leaders in 2018. The first stat I wish to highlight is that companies without a statement of purpose perform 42% less effectively than those with one. Generating a statement of purpose can be a surprisingly unifying exercise in teams and one which I have increasingly incorporated as a fluid exercise, rather than taking days to refine. Having the statement of purpose then gets you on a par with the average performing organisation, but what exponentially outperforms other companies (by an additional 42% ) is being described as a purposeful organisation, in other words, living and breathing that purpose. Not only does it raise employee engagement and unify staff, but it is seen to improve customer loyalty and build organisational resilience in a context of uncertainty. I have definitely spent time generating statements of purpose with teams, but less time deliberating on how they then behave purposefully. I think I’d like to give that a try! Digital transformation is the next theme I’ve extracted and purposely, because I usually shy away from it at leave it to the ‘techies’. One of my key clients at present is definitely not a laggard in this area, which is seen to jeopardise performance negatively by 28% when compared to companies who are digitally savvy. Digital pioneers are those who will move beyond just ‘doing digital’ to ‘being digital’. This particular client is seeking to automate processes that drain time and energy and allow artificial intelligence to free up key staff to better service clients. I certainly don’t have the answers in this space, but I am seeing that going digital is a distinct opportunity to innovate and create momentum in the business and taking your people along with you is key to that transformation. So they certainly do want social network-based learning and mobile-device based learning, but this is not what they are seeking more of (though gaming is an area in which more experimentation is required). 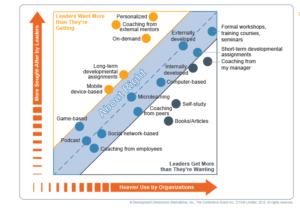 And it seems that learners need less self study and the over- abundance of articles to learn from, along with (rather surprisingly) less coaching from my manager. The study suggests that this may be because managers are generally poor at coaching and learners would prefer external coaches. 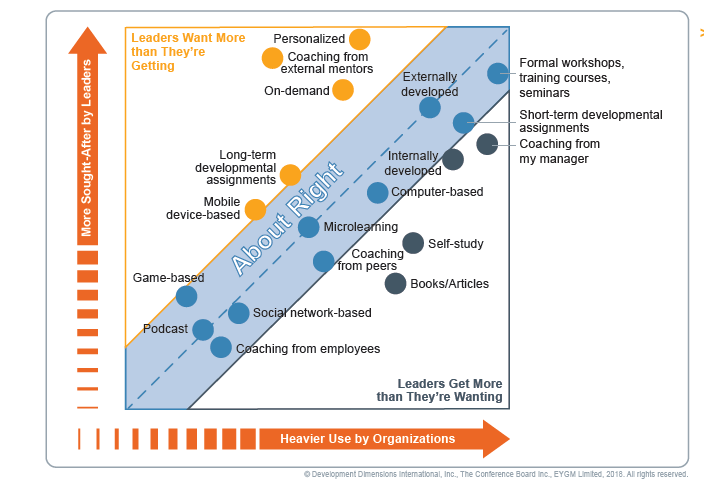 Interestingly when ‘high potential’ leaders were extracted as a subset, their first choice of leadership development was coaching by an external coach, followed by formal training and workshops. So there it is; 3 themes with fascinating learning.